YOU NEED TO INVESTIGATE THE COMMOTION. Yes King "fuse a mêlée of styles from hip hop, dance hall, raga and ska into their own unique brand" and this creation falls fairly and squarely at the feet of production duo Mark Rae and Rhys Adams. Introducing the album is the first track, Champion Sound, an "afro-disco-bashment stomper" threatening to get the dance floor pulsating  and all the walls with it! The hard-hitting Style Come Different is next, described as a "psychedelic disco groove" with gritty dancehall vocals from Sweetie Irie. Sweetie has been at the forefront of the UK Ragga scene since the '80s, collaborating with artistes such as Ian Brown and Gorillaz. Why stop when you're on a roll? Sure to win R&B and reggae fans over to the Yes King sound is Circles  featuring the vocal talents of Ayak. Twenty-two year old singer/rapper Ayak has had a lot going for her since she won the 2004 Prince's Trust Urban Music Award. Also featured is One Of Those Days, a swinging hip-hop head-nodder where Mystro  who already has a critically-acclaimed debut album and who is arguably the UK's finest lyricist  invites you to join him on an expressive journey through a medley of strings and stabs. Infectious horns and hard-hitting beats charm the pants off you with Crunch, featuring four of the UK's most respected MCs: Tor, Ayak, Mystro and Baby Chann  the only female member of legendary UK bashment crew Suncycle. War is a Mexican ska/rock sound with roots vocal from UK-based dancehall artiste Kenny Knotts, who has earned a string of top ten hits and the title track Rock This World features an absolutely not-to-be-missed collaboration of Dawn Penn  immortalised by her dancehall classic No, No, No  alongside Mystro and Kenny Knotts. Everybody's favourite, 40 Long Days, adds a marriage of gospel, soul and pop  guaranteed to get you singing along with the compelling harmonies and then Ayak is back to work her magic with Love Revolution, which allows her to demonstrate the full range of her lyrical and vocal skills. Original Jamaican reggae deejay of Hi Power Sound-system Prezident Brown brings us back down to Earth with a bump. His optimistic song Tomorrow Is Another Day (way to go, Scarlett!) brings the sunshine into your life, wherever you are. If you can stay the pace, the beautifully-arranged Claude's Theme is the only instrumental on the album and crosses new boundaries in instrumental Hip Hop. Last up is Elevate, a classic-sounding soul track with a mature and lifting performance from a youthful Ayak. 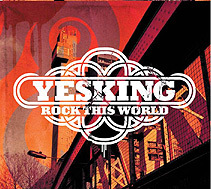 And finally, three excellent bonus tracks are included as a taster of more to come from the terrifically-talented melting pot of Yes King. Great and stimulating music is pouring out thick and fast here. Hit me with your rhythm stick  and keep it coming, guys!